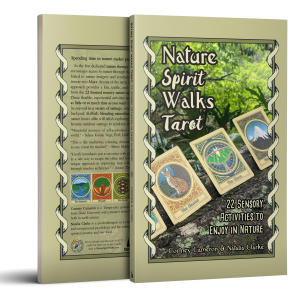 Lady Nowe recently interviewed Nature Spirit Walks Tarot author Cortney Cameron about her inspiration and process for creating the book and cards. We have reproduced the interview below. LN: I love nature and enjoy seeing your passion for this type of healing. What drew you to learning more about nature’s healing energy? I grew up in the Foothills of the Appalachians in a rather rural area, so much of my childhood was spent exploring the many miles of river and acres of woods that were accessible within a few hundred feet of my back door. I am also a geoscientist by profession, which I selected in part due to the career’s opportunity to get outside from time to time, as well as to understand and protect natural resources. My family has always appreciated nature in its own way — my Mom always took pictures of wild flowers, my Dad loved taking long drives to find obscure views and parks, my Grandpa never missed a chance to take us to some park. I think this will be a familiar story to many — even in little activities as simple as sitting outside on the porch, people across the world over enjoy spending time in nature. Given how modern society is really structured in a way to disconnect us from nature, I think people’s continuing attraction to nature — in spite of how hard modern society makes it to do so — really shows how innate this desire to connect is. So, I think a lot of people intuit nature’s healing energy, so it isn’t something you even have to learn so much as experience, something as fleeting as a flower’s beauty catching your eye — but I became more interesting in its formal study through work with the Natural Wellness Academy’s multi-dimensional approach to holism, as well as my own personal experiences in nature. Through my research, I came across the more formal terms “nature therapy” and “ecotherapy” (and several others describing essentially the same thing) and began reading the theory and studies done in those fields. LN: What healing and experiences have you personally experienced from spending time in nature? During college, I took a medical leave of absence, driven in part by illness as well as my father’s death during my senior year of high school. I returned to my home in rural North Carolina, where I could escape the (what was to me, a big) city life. Memorably, I raised some chickens, which is a form of nature therapy, and of course, I had more opportunities to spend time in nature and refresh. At the end of a year and a half, with little formal treatment, I was able to successfully return to college and graduate and even pursue a graduate degree. More recently, my mother died last year, and the day I got that call, I had driven two hours to the mountains, to a family piece of property we retain in the Foothills, where my father’s ashes were scattered, that I hadn’t visited in probably a year or more. I had spent the day there really rejuvenating and enjoying myself. Before I left, I noticed this incredible tree with a humungous burr where it had survived something catastrophic but healed itself and continued to thrive, and I took a picture of it. As we were heading home, I got the call. My mother would have died basically around the time I had arrived to the property. There’s a part of me that feels she sent me there. Obviously the news was devastating, but I wonder how much harder it would have been to stomach in that moment if I hadn’t just spent the day in nature, at that place. Just generally, looking at something like a river or a geologic formation, really feeling the weight of millions of years, it’s very sobering and calming to sit in front of that kind of wisdom and experience. It helps me know that my problems are very small and temporary. Less dramatically, if I am feeling flustered, I make myself take a walk outside and look at the sky or a tree or whatever catches my eye. My husband laughs at me sometimes because I always tell him things are “lucky” – practically every animal or plant that catches my eye. In particular, cardinals remind me of my father, whose favorite color was red. Now, certain wildflowers and the Indian River remind me of my mother, who loved photograpy and kayaking. I like to think of these as little messages from my parents. To me, there is no such thing as an “unlucky” sighting in nature; I even like seeing crows and vultures. A lot of people don’t like vultures, but did you know they tend to be very loyal to their families (with lines living in the same area for decades), perform essential ecosystem services, and mate for life? Everything I witness is a gift. LN: What has surprised you most about this journey of connecting with nature? I was surprised by the robust body of evidence showing how powerful nature is as a healer. While it’s quite intuitive to me and many others that nature provides a healing power, intuition doesn’t always align with science (as many in the natural wellness community will know). As a scientist myself (although not in health), it’s important to me that modalities have at least some empirical backing, so I was very pleased that nature therapy has a number of works supporting its efficacy. Of course, even if the evidence is inconclusive, it just feels good to spend time in nature, and that’s all that matters. I was also surprised by the strong history and tradition of nature healing, whether looking at indigenous cultures, old-timey Western physician’s advice (such as instructing somebody with tuberculosis to go live by the ocean), to modern society, where a growing number of healthcare professionals are sending clients into parks and nature to assist with cultivating healthier, more well-adjusted minds and bodies. There are various researchers and organizations devoted entirely to nature therapy. One thing I like about the community is how diverse and open it is, welcoming artists, musicians, dancers, guides, coaches and other paraprofessionals as very capable of bringing something to the table, as opposed to other healthcare specialists that tend to be very insular and — understandably, to a degree — unwelcoming of non-clinicians. Since nature is the main therapist, so to speak, just getting people out into nature is a huge contribution, so even if you don’t have a clinical background, you can help people through your art, stories, coaching, and so on. Obviously, if you don’t have a clinical background, you shouldn’t be practicing psychotherapy or medicine, but paraprofessionals can certainly encourage nature access in creative and meaningful ways. LN: What has your relationship with nature been like? What was it like before compared to now? As I’ve gotten older, the more instinctive connection I’ve had with nature my entire life has become something more concretely defined. For example, I recently identified myself as a pantheist and religious/spiritual naturalist (hat-tip to the Religious Naturalist Association). As an adult, I’ve also started to realize and accept the responsibility I have for nature through my behavior, and I try to behave ethically in that regard. I’ve also developed a much more scientific understanding of many aspects of nature, which far from making it mundane, has really allowed me to appreciate more just how amazing nature is. As I mentioned, I spent a good deal of my free time as a child in the woods and outdoors, but as an adult, it’s easy to get too caught up in daily life to stop and enjoy nature. Children seem to connect to nature so effortlessly, but adults really have to make a conscious effort to get out there and enjoy it (without secretly thinking about emails or other chores the whole time). This is certainly true for me. You seemingly have to go out of your way to access nature, which is something I’ve tried to address through my work with the Nature Spirit Walks deck. When you make the time, though, nature never fails to disappoint. One thing that hasn’t changed at all is the childish joy I experience when I explore wild places! LN: This book and deck of cards is gorgeous. Tell us more about the process of creating them. As I became more familiar with the idea of nature therapy and environmental education, one thing that stood out to me was that most environmental education seemed to be really geared for children. Don’t get me wrong, that’s where the focus should be, but I wanted to find a way to reach out to all ages, keeping in mind the particular obstacles that adults face with nature access. 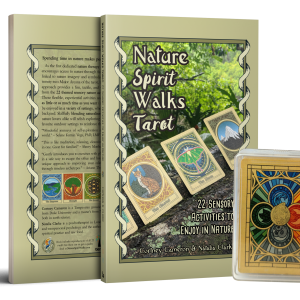 To make a long story short, this particular solution came to me after being exposed to the symbolism of the tarot through Dr. LJ at the Natural Wellness Academy, and that sort of sparked the idea of combining that powerful imagery with nature activities. I knew it would be a very fun and mystical way to pick an activity with virtually no effort (just draw a card). Once I had that idea, I started by crafting a list of cards with nature imagery that I thought would be widely recognized or available as well as appropriate to the Major Arcana archetypes, along with a general vision for what I imagined they would like look. From the get-go, I imagined a bold art noveau style, with bright colors, thick lines, and a sort of stained glass look, as I felt this would provide more symbolic imagery that would be conducive to users developing their own interpretations of the cards. I teamed up with an artist to execute that vision, and he obviously did a fantastic job. I also began drafting a list of activities; some cards came to me much more easily than others, and that’s one reason I knew I’d need some help. On top of that, while nature therapy isn’t necessarily clinical, I did want to incorporate the oversight of a mental health professional (I’m a geoscientist), so early in the process of creating the activities, I tagged in my co-author, psychotherapist in the UK, to provide input and oversight. We bounced ideas off of each other, and she helped me get to the core of the book’s message, cutting out tens of surplus pages (it helps that she was previously a professional editor) where I was droning on about obscure scientific or historical facts, which while interesting (to me at least), bogged down the reader in too many details. There were a few cards we struggled with, but eventually our muses found us, and we came away with what I feel is a very solid and clean product laser-focused on the nature activities with just enough contextual information to ground the reader. LN: How do you most enjoy using the cards? My husband and I draw a card each day on my way to work, to give ourselves food for thought based on the themes and concepts discussed in the book; it’s a fun morning routine to see what we get and how we can tie that back to things we’ve seen or experienced recently. I also try to incorporate the corresponding activity on my break at work, for example, touching a tree if I get Strength. That was one of the most important foundations of the project, that the activities be widely accessible; as I work a full-time office job, I know how hard it can be to get a full nature dose (like going deep into a forest) during any given weekday, so we very consciously designed the activities to take advantage of the pieces of nature available almost anywhere. Just having the cards around is a tangible reminder to me that I need to make a concerted effort to get out in nature, for my own good – but I also feel it’s important for nature itself, as connecting people with nature will help inspire them to protect it, much better than any scary warnings or technical lectures will. LN: What are some ways others can use them? Of course, the main appeal of the cards is the daily theme and nature activity, but I’ve personally found several other uses for this deck. Tarot cards tend to be fairly large (2.75″ x 4.75″) to show off their lovely artwork, but that size can be unwieldy to carry around, which is why we went with a somewhat unorthodox poker size (2.5″ x 3.5″), which can more easily fit in a back pocket (which is where I often keep mine). As I’ve been taking photos of them in various nature areas I go, I’ve realized they make great photo props and decorations! Furthermore, like most random-type activities (e.g. flipping a coin), they can help make simple decisions — something as silly as, let’s say you can’t decide where to eat, so pull two cards out (let’s say they end up being Chariot and Emperor) and assign restaurant A to Chariot and B to Emperor, then shuffle the two and draw one to figure out where to go. We’ve even had our cat pick a card by holding them in front of him and seeing which one he touched. Finally, since the deck only includes the Major Arcana, it wouldn’t be appropriate as a full tarot, but you could combine it with another deck to do traditional readings. 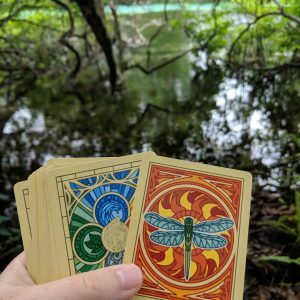 As I mentioned in my last answer, I also think just having them around is a good reminder to get out in nature, even if you don’t necessarily draw a card for it.